Is ‘Vijaya Karnataka’ ready for a Dalit editor? Vishweshwar Bhat‘s exit from Vijaya Karnataka yesterday has been treated by the paper’s owners and managers with the same contemptible gracelessness that has been the hallmark of their conduct vis-a-vis journalists in the last two decades. There is not an announcement in today’s paper nor an explanation. It is as if the reader, who is told why Yana Gupta didn’t wear her underwear, somehow doesn’t deserve to be told why there is a change at the top of the State’s biggest newspaper, in today’s imprintline. The boiler-plate internal Times VPL memo, designed to reassure the rest of the flock and cool their anxieties, announces the name of E. Raghavan as the new consulting editor of the paper, on top of his current responsibilities as consulting editor of the presciently named Vijaya Next. 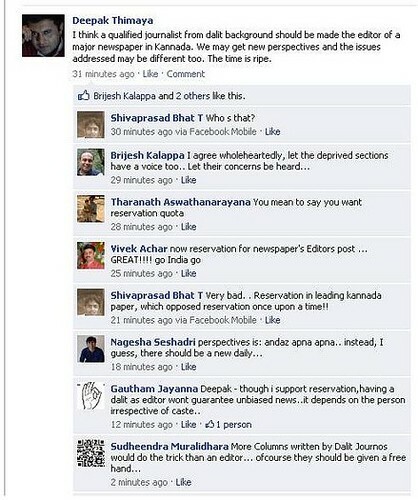 But just what kind of new editor should a mass-circulation paper like Vijaya Karnataka get? The Udaya TV anchor Deepak Thimaya, who did a short stint as editor of Vijaya Next before being replaced by Raghavan, has posted a provocative suggestion on his Facebook page. Thimaya doesn’t take the name of Vijaya Karnataka, of course, but the hint is clear. Anybody here who’s Dalit and speaks English? This entry was posted in Issues and Ideas, Kannada & Karnataka, Media, Mysore-Bangalore and tagged BCCL, Bennett Coleman & Co Ltd, Churumuri, Deepak Thimaya, E. Raghavan, Rahul Kansal, Ravi Dhariwal, Sans Serif, The Times of India, Times VPL, Vijaya Karnataka, Vijaya Next, Vishweshwar Bhat, Yana Gupta. Bookmark the permalink. Deepak T is biased against Muslims, Christians and other oppressed communities. sorry state …. why they don’t want him on the table. what makes non dalits so special or what different will it yield to their status…… humans suppress everyone around them…. sorry state…. There is merit in the thought. Especially because the former editor reportedly ruffled Dalit feathers. Also, India has come of age. Media should take the lead and see if Dalits can spear-head a cultural, political and social renaissance. It should start in Karnataka which is now leading in corruption. Bengaluru, the capital city has nothing to boast of except some kitsch on the walls! Why do we hear them (dalits) only when they protest against something. Give them a voice to lead. Mr.Deepak Timmayya……..astonished by your comment, pradeep is right in his reply………by the way some people try to prove that they are progessive by doing such comments…….any way it is TOI management which has to decide who should be next editor……..and it seems they have already made their choice ……..E.Raghavan ….a man of around 70 who has seen many journalists like V.B./PRATAP may head the paper………it is better we carry out our jobs ethically rather than worrying about others worry………. It will be a good selection, but at the end of each editorial he must say that he is a Dalit, as he will have the privilege to write any thing about anybody.Nobody will be able to raise any objection and no law will touch them. It seems DT had applied for this post, and did not get it. So he is now focused on some social justice. Further this Dalit should be from very lowly university and not from high class universities such as JNU or JMI. Drop out from IGNOU should be prescribed as the maximum qualification for job. Vijaykarnataka should also distribute their paper free of charge to whoever that can produce “Dalit” certificate. Let us hope there will be new light for our Dalit brothers and sisters. As Dee T says, why not? What about a Dalit to do “Jedarabale” on Udaya TV? A Raja is now jobless. He will be the ideal dalit editor for vijaya karnataka. Where are we heading in this country ? Here I am not concerned whether VB’s departure was good or bad or Mr Raghavan is going to be a good replacement or not.. I believe, Raghav to be rated based on his performance and not on his Dalit background. Time is running fast, we cannot sit and debate on whether Dalit is good or Bramhin is good or a secular (if it ever existed) is good.. It has to be a person specific rating..
People read a NEWS Paper for it’s contetnts, editorials, columns and Supplements NOT because if the Editor is a Dalit or no-Dalit or what-so-ever it is…..
It’s looking odd to see the educated mass discussing the issue in these lines…. An Editor is a mentor/supervisor/decision maker for any publications and all it matters for the publication/News paper to be successful is how contentful/reliable/quality are the Contents of the News paper. Remember that Media is one of the Pillar of any Society…and an Editor actively will be responsible for a healthy society. We ARE talking about person specific rating. Yes why not a Dalit for Jedara Bale? I am sure DT would agree. He is the only one who has highlighted the issues of Dalits over the years on his shows and everyone knows it. His interview with the Dalit Swamiji was one of his best. People should not forget that Udaya tv is owned by people from the Backward classes. Insiders in VN say that when he was the editor there he had said that he would like more Dalit journalists to come the field. true, and we also need a dalit as udaya tv anchor. if u r speaking for reservation why no t awoman editor. from a good academic background . No! Vijay Karnataka(as they spell it) should give free ad space to dalit entrepreneurs irrespective of their commercial success. From what I have heard, V. Bhat was shown door for not encouraging original content promoting BCCL’s Brand Capital customers or even getting new customers from Karnataka! All universities named after Gandhi family scions should have dalit VCs ;-) and State’s legal officers should always be dalits. Dalits should be given prime time on news channels, especially talk shows. The news paper medium and all media is infested with forward castes. Brahmins holding the prime place among the lot- naturally they would not like to make space for a non-brahmin. It is a fact that three percent of the brahmin population of our country crafts the views of the entire nation. They would naturally be reluctant to cede this space to a non-fraternity person. Many of the responses here are from Brahmins or other forward classes. While most people would speak maliciously about A. Raja, not a word is being said about Pramod Mahajan, who was the originator of the policies that Raja continued. Similarly, much venom is spewed on a Dalit Chief Justice Dinakaran- but a Justice Bhalla is spared the venom.. this is a repeated feature of the Indian democracy when Dalits and other backward classes are easy meat for vicious comments. Who are the heroes of our nation- Sreedharan, Atal BehariVajpayee, Pranab Mukherjee, Somnath Chatterjee etc etc. The most reviled- mayawati, Lalu, Paswan etc etc. Is it not a coincidence that the nation’s most loved personalities are often Brahmin and the most hated are dalits and other backward classes.. This list is only illustrative.. but can go on endlessly. Do rethink all that you have said above- lest an alternate system compels us to take the Bahujans serously. this is god way for vk. i await this devlpment. I am in agreement with Dishum. Also, its stupidity that is on clear display by many who have jumped the gun and lost the basic premise. What Mr Thimaya has opined is a qualified assessment of the state of affairs in the society, and one thing that he is closely associated with – media. While no reservation is required by many dalits in the current generation to be offered higher posts in their fields on the basis of their castes, the so-called power wielding facilitators from erstwhile upper castes still are in the transition stage where they are unwilling to be gracious enough to share and acknowledge equality in professional ethics and excellence. India has been witness to this discrimination all along. It is only a very few, the likes of Deepak Thimaya himself, who have quashed the arrogance of the ‘knowledge creed’ by repeatedly proving that they are better in intellect and conduct and have been forthright enough to earn that respect. Mr V.Bhat has had a run for as long as he could. It took another of his kind to topple him from his seat for many reasons unimaginable. An old master Mr Raghavan can only be understood to have cracked the inside stories of VB and Mr Prathap Simha and in a deal of sorts that had a no-go for all parties concerned, i think they have harmed each other. Rather, sorted out without harming each other. I’m sure its got nothing to do with the publication. The TOI group had nothing worthwhile to say in explanation i’m sure hence the silence. I just wonder why we havent heard from M/s VB / PS or is it that they only spoke through their written voice and now they don’t have any amplifier to reach us their voice.. Or is it that a new venture is being brewed and we get to sniff it shortly….. anyway – getting back to Mr Thimaya’s comments, I can only wish for a situation when a person representing a larger section of the deprived lot in society actually comes to have a position of the leader of this newspaper and bring about a positive change in perceptions among all people for bettering the prospects in equal living among all classes of society. I can only say that, for the known calibre of Mr Thimaya and his intelligence or his excellence, or the fairness that he is known for, he should be playing a much bigger role in connecting with the people out in the world than getting stuck with what is majorly a pampered lot on FB or a few like us who seem to have access to better privileged connectivity. His views and debates should be for the real world for a real difference. I feel sad that this has elicited only thousands of words of comments and counter arguments from even those who can obviously be understood to have had no idea of the issue, which is blatant in their posts. This has a much larger significance and context than just a publication that is run for profit, and taking this as a cue, Mr Deepak Thimaya and like minded people should get together and do something more constructive and valuable in balancing the social fabric than just provokingly inspire a few like the ones here to be just part of the disgruntled or supportive groups sharing a lot of words that may only be good enough for the ISPs and Bescom to raise bigger bills. What vk or any otherpaper needs is a non nonsense professiona as editorial helmsman. But the in present atmosphere fuelled by the liberalisation, gloabalisation and privatisation, the post of editor has got devalued beyond redemption. The papers prefer editorial managers than editors. The tribe of good editors and good newseditor has long become extinct in Indian journalism, with few exceptions here and there. vk was not a no 1 paper. it has only been mouthpiece of cheddy people, some swamijies and big corporate and the supporter of these are the columnist in this paper. it doesn’t have the pulse of real kannadigas. hope exit of v bhat may do some good to this paper. I do not understand how caste of a person can be a yard stick to perform a particular job.The editor must be known by his editorial/managerial skills rather than his caste.I wonder how this caste peeps into everything. wonder ahead, do some research, let’s see if you get somewhere. Time to look past tokenism. In any case why would a dalit person become editor of the VK unless he has the go ahead to reconfigure the workings of the paper and possibly cause it lose money? while you and I have to get over 90 % to compete for the same post. consideration and has killed his conscious while entering the job? in deathlike silence the aftermath. dalit being the new editor of the vk is a nice development.the present political leaders of dalit r not satisfactorily rising the issues of this community facing in social field.in order to get the votes of the uppercast they humbly behave and bow their heads.and not rise the issue this same situation is been found in muslim ploitical leaders too. so in such situation if dalit becomes a editor in chief i believe that he can bring the discrimination happening against the dalits the minorties adivasis and the downtrodden classes.let the management of vk do this revelution at the earliest. yeah yeah… I am already thinking.. The first Indian to be sent into space and on to moon should be a DALIT too. Bring caste/reservation everywhere. Instead why not banish non-DALITS from the country ?? Good idea? 3% control the country it seems? what rest 97% are doing? If they can not do anything they really deserve to be where they are now coz 97% is too big a number to do anything.